India’s General Elections 2009: 15 states and two union territories with over 143 million eligible voters went for first phase of polling in 124 Lok Sabha constituencies. The voter turnout is reported to be only 58% to 62%. World renowned sand artist Sudarshan Patnaik has appealed for 100% voter turnout in the remaining four phases of polling. To motivate the voters, he has carved sand sculptures of Indian politicians set against the backdrop of the parliament at the Puri beach in Orissa. View an amazing video clip: Sand sculptures to motivate Indians to vote. 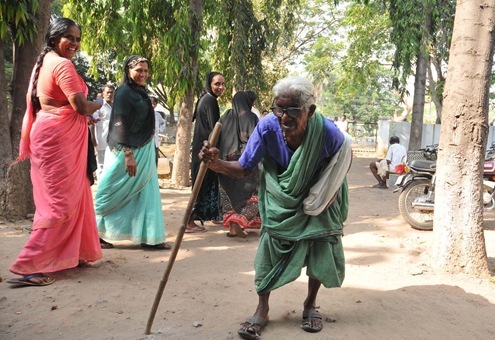 An old woman voter comes to caste her vote, at Mylavaram, in Vijayawada, Andhra Pradesh, during the 2nd Phase of General Election-2009 on April 23. Polling for the second phase of the general elections, covering 140 Lok Sabha constituencies in 12 States, was held on April 23 with 19.40 crore voters exercising their franchise. The voter turnout is reported as about 55%.